Aron Stevens was back on Fired Up with the seventh episode of his show Ask Me Anything, which is available on 108 platforms including: iHeartRadio, iTunes, Spotify, Stitcher, Tune In, SoundCloud, and of course Barnburner.ca. The show is also available on the OSG Sports Network and the OSG Sports app. BarnBurner founder Joseph Peisich, Steve Carney of 95.3 WDAE in Tampa, Florida, and myself joined Aron for this edition of Ask Me Anything, where Aron gave his thoughts on All Elite Wrestling, the toughest scene he filmed on NBC’s Midnight, Texas, and much more. 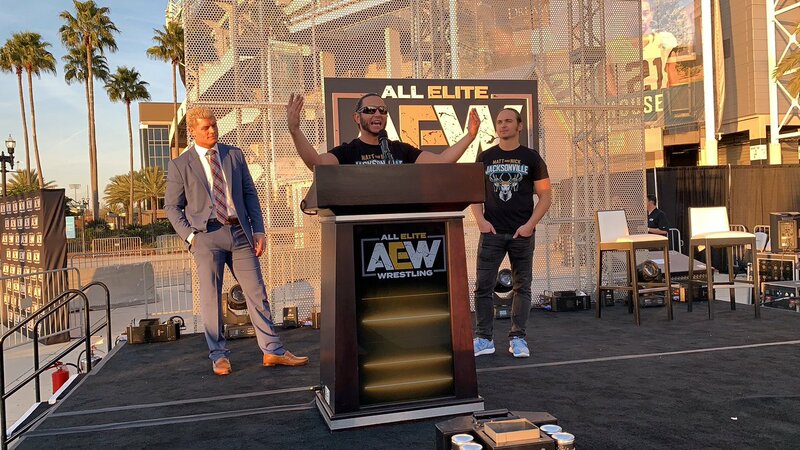 I’m curious as to what your thoughts about Cody and the Jackson boys putting together AEW and what it means for the wrestling community as a whole? Aron: Well I think number one, competition is any avenue…in any arena is good. I would argue it’s great in healthy doses. What I think AEW is doing, they’re trying to create a product that is unique out there out there…that is presenting professional wrestling but presenting it in a way that is really not being done today and I think it’s a way that a lot of people would like to see it. And you know what, have the athletes that perform, have they gone way up as far as their caliber and everything? Absolutely. Is the quote on quote wrestling style a little different? Of course, but there’s also a lot of unchanging things in the business like the wheel, the wheel doesn’t work, it’ll always going to be round, but it’s always going to be there…you know what you get. And there are some things that just work in terms of the simplicity…good storytelling. What was the hardest scene to film in Midnight, Texas? Aron: I had never worn contacts before and they put me in this demon makeup and the contacts and everything…really really cool looking but I had to this thing where I put this guy through this door and he fell into the swimming pool…and I was in the pool, and I was just putting a little heat on his face. And I just remember like the water was getting in my eyes and there’s punches that you would do in pro wrestling and punches that you would do for like a film and television. I know I say I’m not a wrestler and that’s what I used to do, but there are just some things that you just don’t forget and amongst those things…at the top of the list is how to throw a fake punch at someone. So, I was doing my old punches and apparently people thought I was really hitting him…so that was kind of funny, but the hardest thing was because the water was in my eyes and like I was just all over the place and the contacts were bothering me, but I had the presence of mind to just kind of grab him and then like through my pro wrestling training, it actually served me so well out here so that’s one thing that I got to say thank you to the business for amongst other things.